Delegates adopt the COP 21 Paris climate agreement. Are we talking Treaty of Westphalia big or Kellogg–Briand Pact big? In the final hours of the climate summit here, the French hosts — who affirmed their reputation for diplomatic savoir faire and careful preparation throughout the previous two weeks — resorted to a gambit straight from a casino hall: the bluff. Eager to get a deal done by the weekend, France’s foreign minister, Laurent Fabius, and his team went from delegation to delegation, cutting deals and smoothing out tough outstanding points. They did so without showing anyone the actual final text of the proposed accord. Then, on Saturday morning, with President François Hollande on stage alongside Fabius and top U.N. officials, the French brazenly announced that the negotiations were largely completed, with the final draft still in preparation and not ready to be distributed. Sure, every country is required to submit some sort of plan to address climate change. But the content is entirely up to the country. The plans can be ambitious (like Costa Rica's) or laughably weak (like Russia's) or somewhere in between (China's or America's). What's more, no country will be forced to take further actions, and no one gets penalized if they fail to live up to their promises. The only thing countries have to do, really, is report on their progress in transparent ways and submit new plans every five years. The Paris climate conference delivered more of the same—lots of promises and lots of issues still left unresolved. While we are reviewing the final agreement, it’s clear that implementation still faces the same obstacles that we’ve been warning about for years. None of the commitments made, including those by the U.S., are binding, and many aren’t even complete. Moreover, Congress must appropriate any funds that the Obama administration has pledged. The White House’s overall domestic strategy of making energy more expensive and less abundant to satisfy international constituencies, many of whom compete against the United States, should worry the business community, American workers, and consumers. The truth of the matter is what happens in Washington, D.C. over the next few years will be more important to Americans than anything that happened in the last few weeks in Paris. Legislation to reduce carbon emissions—like cap-and-trade--hasn’t gotten through Congress, and with climate and environmental issues low on the public’s radar, it won’t be a priority anytime soon. A Morning Consult poll finds that only 5% wants President Obama to focus on climate change. 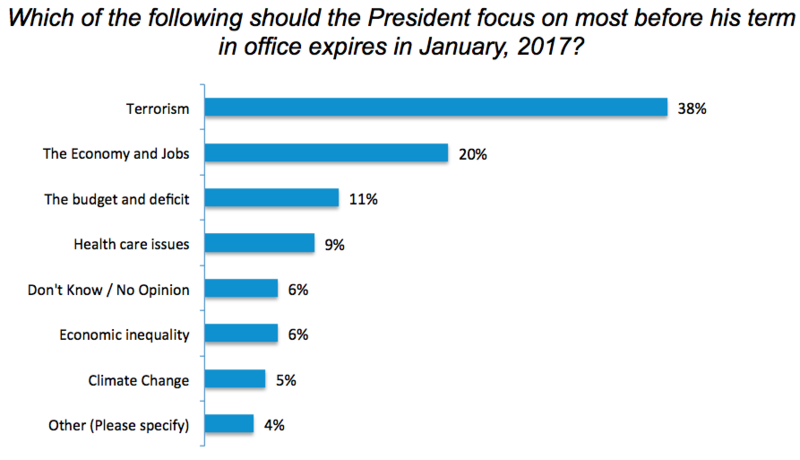 Thirty-eight percent instead want him to focus on terrorism, and 20% want him working on jobs and the economy. A Gallup poll finds similar results. Only 3% said the environment was their top issue. This legislative obstacle forced President Obama to rely on EPA and its Clean Power Plan to drive out coal use through regulatory means. EPA’s regulatory action has sparked a legal reaction. Twenty-seven states and over a dozen business groups (including the U.S. Chamber) are suing to stop EPA’s illegal attempt to reengineer the power grid. The legal fight over is likely to end up before the Supreme Court. And even with the legal fight underway, a new president in the White House in 2017 could do a policy 360. In short, Americans worried about electricity prices, power grid reliability, and the economic effects from harmful federal energy policies should pay more attention to happens inside the beltway than what happened in Paris. One final point: Ironically U.S. carbon emissions have come down over the last few years because of the development of more fossil fuels, particularly shale natural gas through hydraulic fracturing—something anti-energy activists hate. Just like no one predicted the shale boom, no one knows what energy innovations (big or small) lie in the future. What we do know is the appetite for affordable energy will not go away, and fossil fuels will satisfy that appetite for decades to come. It’s a pipedream to expect otherwise, and it’s an even bigger pipedream to craft policies that ignore those realities. Sean writes about public policies affecting businesses including energy, health care, and regulations. When not battling those making it harder for free enterprise to succeed, he raves about all things Wisconsin (his home state) and religiously follows the Green Bay Packers. Pretty much everything in a brewery that isn’t an ingredient or a stool is made of metal. More than $1 billion of the state’s exports are vulnerable due to the emerging trade war. From manufacturing to agriculture, business owners are coping with the changes to come. For small businesses, there are no winners.